One of the chief aims of Sociologists for Trans Justice is to advance public understanding of trans and non-binary issues – in particular, to enter sociological insights into the national conversation about the status of trans and non-binary communities. To that end, one S4TJ committee will soon publish a #TransJusticeSyllabus, which will feature suggested sociological readings in transgender studies. They have already launched an associated website (TransJusticeSyllabus.com) and Twitter account (@TransSyllabus). The #TransJusticeSyllabus, like prior accessible syllabi (e.g., #CharlestonSyllabus, #PulseOrlandoSyllabus), aims to raise awareness about how the social structures of gender, race, sexuality, and others shape trans people’s lives. Furthering this goal, another S4TJ committee has successfully launched a directory of experts on trans studies that makes it simple for members of the press to find sociologists to interview for news coverage of trans and non-binary issues; the directory is available at TransJusticeSyllabus.com. (Add your name to the directory of experts at www.transjusticesyllabus.com/2017/03/15/directory-of-experts/). Trans studies is a relatively young and small field that is further hampered by its marginal status in academia (even in sociology), including the dismissal of research on trans and non-binary communities conducted by trans and non-binary identified scholars as “me-search.” Thus, the second goal of S4TJ is the advancement of trans studies in sociology itself. Over the past year, S4TJ members have been working to eliminate barriers to conducting trans studies research. For example, one concern that was raised at the 2016 meeting was journal editors’ overreliance of a small number of peer reviewers for submitted manuscripts related to trans and non-binary issues; a related concern was that colleagues who lack expertise on trans and non-binary issues are often invited to peer-review articles on the subject. To address this, S4TJ is currently developing a list of potential reviewers to provide to sociology journal editors for articles on trans and non-binary topics, easing the difficult task of finding appropriate reviewers within this relatively small subfield. S4TJ has also looked for ways to create opportunities and resources for trans studies scholars. One committee has compiled an archive of datasets, publications, visual arts, conferences, organizations, and other academic resources related to research on trans and non-binary communities; this compendium of resources is available at TransJusticeSyllabus.com. They also successfully proposed the creation of a regular ASA session on Trans Studies, providing another venue for sociologists of trans studies to present their research. The session will be hosted for the first time at the 2018 ASA Annual Meeting in Philadelphia, PA. In the future, S4TJ will continue to pursue new ways to facilitate research on trans and non-binary communities. For years, LGBTQ and ally sociologists have expressed concern about discrimination against trans and non-binary people in sociology, including on the sociology job market. Thus, the third aim of S4TJ is to advance trans and non-binary identified people within sociology. One S4TJ committee is focused specifically on eliminating transphobia and cissexism within sociology. This committee is currently developing a “best practices” guide for sociology departments to better support trans and non-binary students and faculty. They have also worked to make sociology conferences more trans-friendly, including hosting a trans and gender non-conforming (TGNC) hospitality suite at the recent 2017 Southern Sociological Society meeting and encouraging sociology societies to include gender pronouns on conference name badges. Soon you’ll see a spot to list your pronoun on your ASA conference badge! Finally, S4TJ is working to support the next generation of sociologists who are trans and non-binary. We will soon be launching a survey to capture the experiences of trans and non-binary graduate students in sociology and, in turn, propose appropriate initiatives to best support them. S4TJ recently launched a mentoring program to contribute to the professional development of trans and non-binary sociologists, as well as trans studies scholars. (To sign up for a mentor, complete the following form by July 22: bit.ly/2r0qSSM. Faculty of any gender who would like to sign up to serve as a mentor should complete the following form: bit.ly/2r9nHYi). 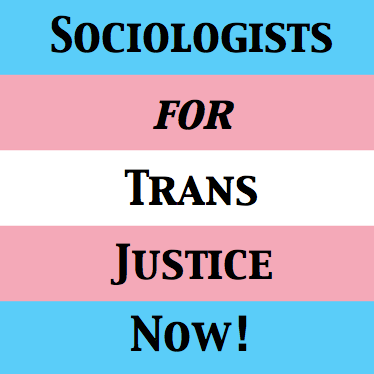 Sociologists for Trans Justice will reconvene for its second meeting at the upcoming 2017 ASA meeting in Montreal on Sunday, August 13, 8:30-9:30pm, in Palais des congrès de Montréal room 518C, following the Sociologists’ LGBTQ Caucus meeting. We invite you to attend. In the meantime, like us on Facebook, follow us on Twitter, and join our listserv: https://groups.google.com/forum/#!forum/sociologistsfortransjustice/join. We welcome your support to put sociology in action to improve the lives of trans and non-binary people.